Our below ground concrete slope front tornado shelters are engineered, tested and meet the highest quality standards at a competitive price. We use all of the excess dirt around the shelter as a berm to provide extra protection. This unit comes in 3 sizes, the small 5′ x 7′ x 6’2, medium 6′ x 8′ x 6’2 and the large 6’8 x 10 x 6’2. A boom truck is needed for all 3 units, so there will need to be a minimum of 9′ wide and 13′ height of clearance. However, for the 5′ x 7′ unit we can use a full size backhoe to complete the installation. 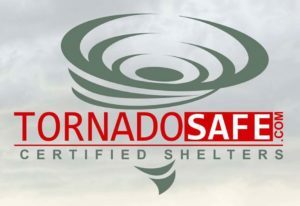 Our below ground concrete flat top tornado shelters are an excellent choice for those who want a shelter without the berm that the slope front unit provides. We remove all of the excess dirt from the installation at no additional charge. This unit comes in 2 sizes, medium 5′ x 7′ x 6’2 and the large 6’8 x 10 x 6’2. A boom truck is needed for all units, so there will need to be a minimum of 9’W and 13’H of clearance.